Standard Concession Supply features a large selection of Cotton Candy Supplies and our popular resealable cotton candy cups. And you don't have to order our supplies in large quantities. Here you can a find a complete line of cotton candy supplies to create fluffy and eye catching cotton candy. Our floss sugar cotton candy mix creates a wonderful sweet aroma that will drive customers right to your cotton candy stand. Standard Concession Supply also features the Paragon Spin Magic 5 Commercial Cotton Candy Machine and The Econo Floss Cotton Candy Machine from Gold Medal to produce that fluffy and delicious cotton candy. If you are looking for another model or a certain type of cotton candy supply not listed, feel free to email us at funfoods@cox.net or give us a ring at 757-473-8951. If you need cotton candy machine parts, you can contact us by phone or email with your inquiry. We are here to help. For our in home mini cotton candy machine and other cotton candy supplies, go to our nostalgia electrics appliances page. And to learn the ins and outs on how to make cotton candy, see our flossine item description below. 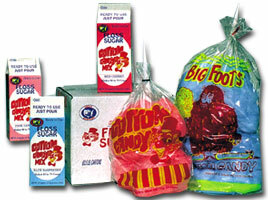 Pre-Packaged cotton candy by the case. Packaged in 32 oz plastic cups with lids. 24 cups per case. Delicious mouth watering flavors including pink vanilla and blue raspberry combos. Our Cotton Candy Cups are great for birthday parties, school carnivals, and other special ccasions. Also great item for rental operators with Moonwalks and Bubble Bounces. Our printed cotton candy bags come packed 1000 per case. The bags measure 12" x 18". Beautifully printed clown design. If you are making your own cotton candy, then these bags are for you. Divided by 10 100 Printed Bags Per Header. These printed cotton candy bags are strong and sturdy. Made of a heavier plastic. No ties included..
Cotton Candy Bag Twist Ties. Cotton Candy Bag Twist Ties. Twist ties currently come in two colors blue and orange. Packed 2000 per box. Great for smaller parties and events. 100 Count Clear Cotton Bags with Twist Ties. Clear Fun at The Fair 48 oz Cotton Candy Bucket. Fun graphics of this design makes it great for cotton candy and other concession items. Packed 200 cups per case. Lids can be ordered upon request. They are packed 16 per bundle at $2.35. Flossine is the ingredient necessary to make cotton candy. Mix one to two tablespoons of your favorite flavor to 10 lbs. of sugar - either cane or beet sugar. Mix thoroughly! Then you pour the sugar into the open area of the head part of the machine. Most machines hold several ounces of the sugar. You turn on both the heat and motor buttons, and as the head spins at high speed, the heating coils within the head temporary liquidfy the sugar. The force of the spinning pushes the liquid through the floss ribbons which are located in the head of the machine. The liquid now cools back to a solid state and eventually forms to what is known by everyone as fluffly cotton candy. Case of Ready To Use Flossugar. Packed 6 1/2 gallons. Variety of flavors! Each half gallon of floss sugar makes 40 to 50 cones depending on the humidity. The humidity of summer can reduce the production output of making cotton candy whether you are putting it on a cotton candy cone or in a plastic bag. When possible, it is advisable on humid days to make cotton candy in premises that are air conditioned to create the fluffiest cotton candy possible. Of course in the winter, ideal conditions are present to make the best cotton candy to everyone's delight! Our ready-to-use flavored floss sugar mix is premixed and designed to pour directly into a cotton candy machine. Depending on our inventory, we will ship either Victor Products or Great Western Floss Mix. Cotton Candy Magic Flossugar in one half gallon container. Don't want to buy a whole case of cotton candy mix? Need just enough to make cotton candy for 75 or maybe 150 people for your birthday party or special fun day event, then purchasing ready to use cotton candy mix by the half gallon is definitely the way to go! Each half gallon makes around 50 cotton candy cones. Our flossugar creates a sweet delicious aroma in the air. And our flossugar creates fluffy colorful cotton candy for your cone, bag or cup! Depending on our inventory, we will ship either Victor Products or Great Western Floss Mix. Whip up some cotton candy with these paper cotton candy cones. Packed 250 per case. Great way to serve cotton candy on the go. What a great way to display your cotton candy made on a cone,,,but even more important, this cotton candy will allow you make some cotton candy cones in advance to assist you when there is a rush for cotton candy. Help keep your lines shorter for cotton candy and keep people from walking away who do not like waiting in long lines. Made of stamp aluminum with 8 tapered holes. Two extra holes more than your standard tray to allow you to hold extra cotton candy cones. New from Paragaon...Cotton Candy Sugar in a easy pour bottle. Each attractive bottle holds 4 lbs. Paragon's floss sugar is made from a special sugar that is not too fine, not too coarse. Floss sugar is packed in a sealed easy pour bottle. Unscrew the bottle and pour directly into the spinner head. No messy mixing or unsanitary sugar buckets. Comes in 8 different delicious flavors. Jumbo Cotton Candy Starter Kit. Just purchased a new cotton candy machine or looking for enough cotton candy supplies for 150 people? Then this cotton candy starter kit is for you. This kit includes 150 cotton candy cones, and 100 cotton candy bags, and 3 1/2 gallon of pre-mix cotton candy floss sugar. Flavors include one pink vanilla, blue raspberry, and grape. 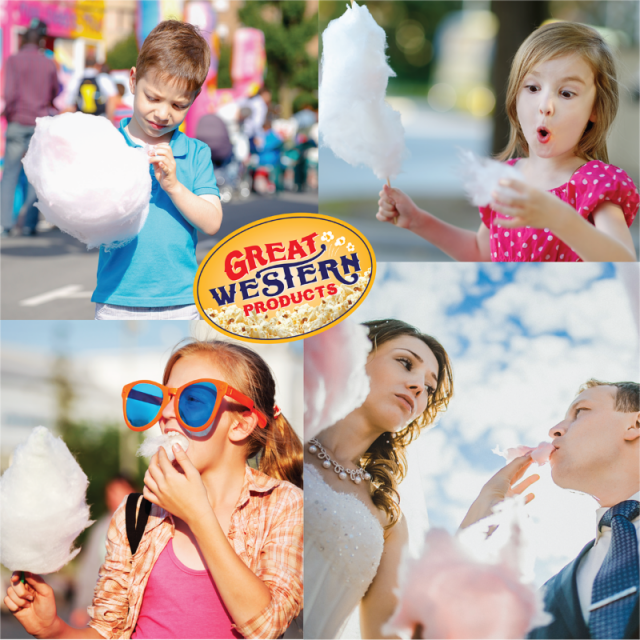 Check out our new Commercial Cotton Candy Machines for both Fun and Profit.